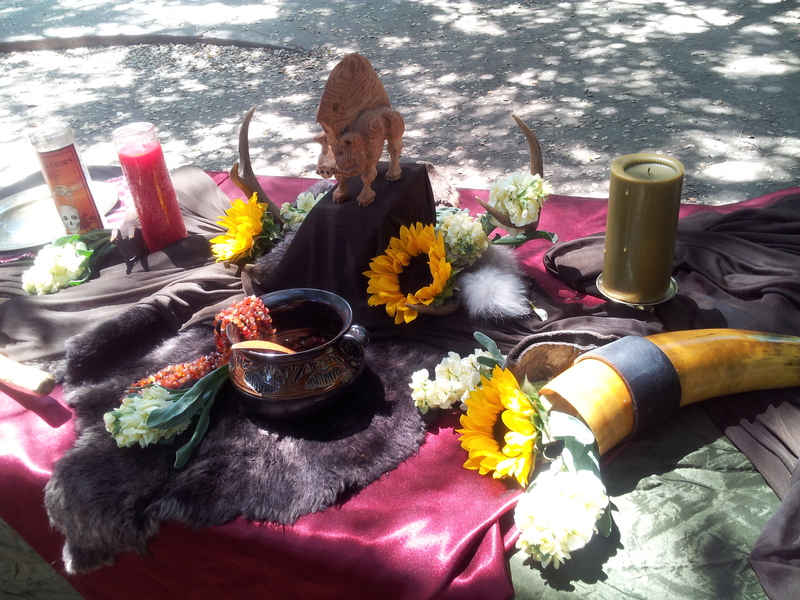 For several years now I have been wanting to hold a feast in honor of the Dagda. Several different variations went through my mind, but for whatever reason they just never came to past. 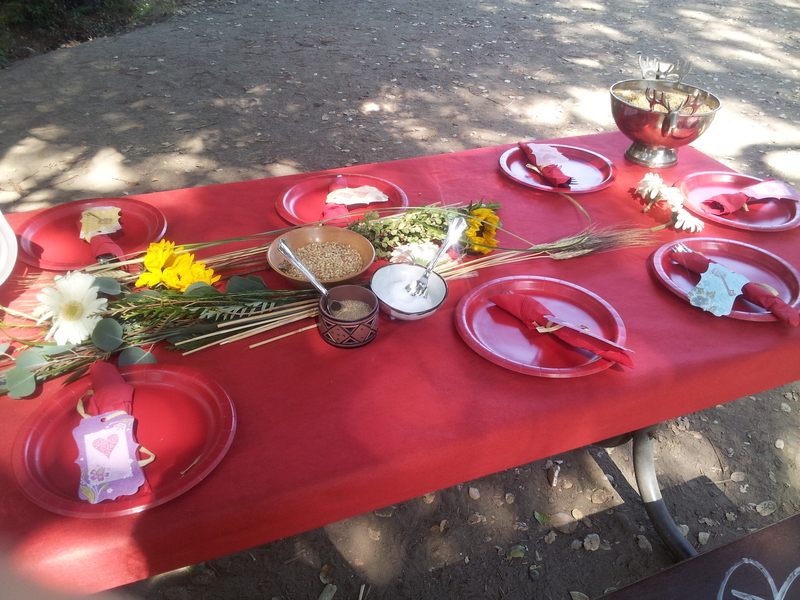 Then in my public priestess community of CAYA Coven I was presented with the opportunity to lead a ritual feast in his honor. Even more exciting this could be an outdoor feast! Early in the year I started plotting out the best way to introduce the Good God to a group of people who may or may not have ever heard of him. How best to honor his name and ensure a good time had by all. Luckily I had an amazing crew, all of the initiates who are training to be public clergy in CAYA. They all went above and beyond and put such heart into their work it was really touching. We were gathered in one of my favorite parks where there lives a 100 year old Oak tree. A wonderful tree that I sadly did not get to go visit this trip but love none the less. We spent the day grilling and playing games. Coconut shotput and Tug of Way being the highlights. I had originally dreamed of having a whole pig to roast for the feast but alas my budget at present did not allow for it. However I did go out and purchase the biggest shoulder pork roast I could from the local butcher, ethically sources and top quality. I decided to start cooking it the night before to ensure that it would be done in time for the Feast, and would finish it off over the open flames basting it in fresh apple juice. I have to say that I think it turned out delicious and since there were literally no leftovers and many folks asking for seconds, I think that is a far judgement lol. I will be making that pork again once I get a grill here at the house. I kept telling myself that it would be a small crowd. 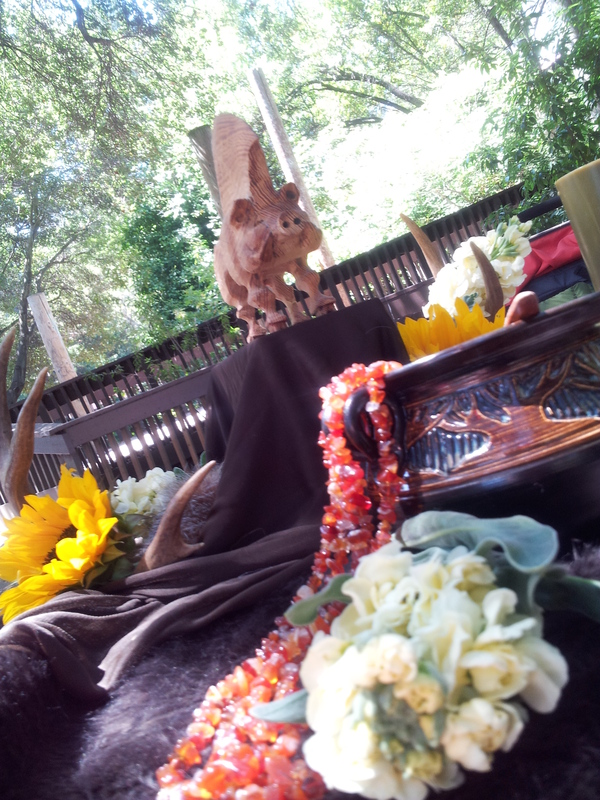 Our outdoor rituals are usually smaller more 30-40 people than our indoor rituals that get more 60-80 people. Yet I was surprised, we had quite a turn out! I didn’t do an official head count but I think we were in the 50-60 range. Yet with great joy we made room for all. With equal joy we had more than enough food. There is nothing so sad as a feast where there isn’t enough food for people to eat their fill. 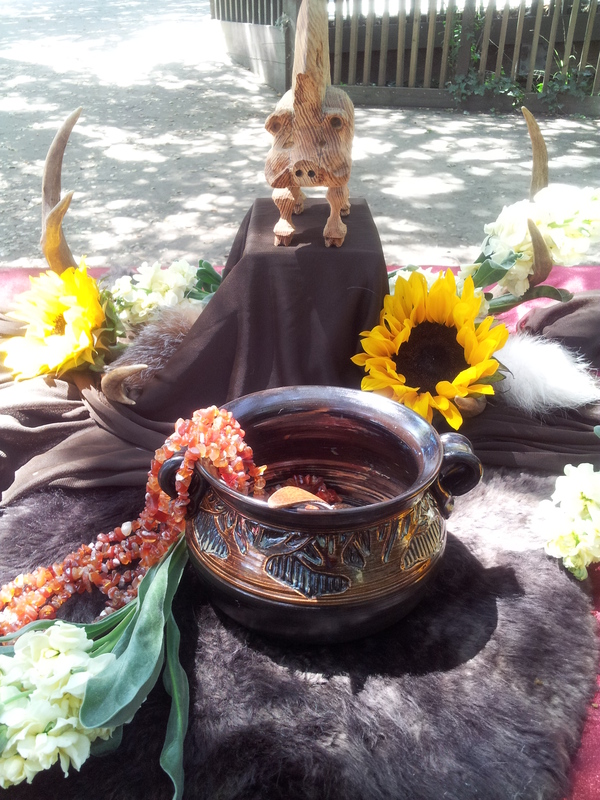 And at a Dagda feast? Unthinkable! I was so pleased and still am. For a public feast I do not think it could have gone any smoother. Thank you again to anyone who attended, to all the lovely people who pitched in and helped to make this dream a reality. Thanks to my beloved Dagda for continuing to teach me the ways of leadership, hospitality and enjoying the lust for life. May I continue to bring you honor and raise your name high. Looking forward to sharing more celebrations and joy with the community and for continued joy in devotion to the Good God.